It is widely known that brown rice is the healthier option between white rice. Many sources like food blogs and health articles highlight the extensive refining process of white rice against the wholeness of brown nice. However, while the facts are there, there isn’t necessarily one that is better than the other. The glycemic index (GI) is a food classification system that is concerned with how quickly or high food can raise blood sugar levels. The higher the GI level, the faster it will be digested, and the higher your blood sugar levels will be. On the other side, the lower a food’s GI value is, the slower it will be digested, and corresponds with the rate and lower levels of blood sugar. 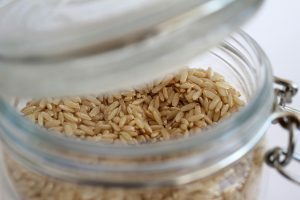 Brown rice has a lower GI than white rice. This means when we consume brown rice, its sugars release slowly into our blood stream. This is said to aid people who have conditions like diabetes where blood sugar control is vital to maintaining health. However, despite white rice’s generally higher GI level, eating some types of white rice like Basmati or Jasmine rice in moderation is okay. These types of rice have low to medium GIs. Basmati rice is also low in fat and contains all eight essential amino acids, folic acid and is very low in sodium and bears almost no cholesterol. It’s also important to note that Basmati rice also has significantly less exposure to arsenic than long grain brown rice does as well. In general, however, carbs with low glycemic levels can promote healing toward an overgrowth of organisms that can cause infections like Candida that can cause yeast infections. While it’s said that the milling process takes away nutritional value such as B vitamins, manganese, phosphorous and iron, it also simultaneously takes away harmful elements such as phytic acid that are present in the bran (the outer shell of the rice grain) that is hard on our gut and intestines. This particularly affects people on specialized diets who rely on their intake of minerals from rice and it could possibly lead to iron and zinc deficiencies. Finally, when making choices about which rice to consume, it is important to note that if you have a severe gluten intolerance such as Celiac disease, that you should be buying certified gluten free rice. Anything that is processed is subject to cross contamination – and you do not want to risk buying rice that could be harmful to you. We recommend looking into brands like Lundberg Family Farms, Alter Eco, or rice that has been imported from a country where little wheat is grown and processed such as Thailand. We also recommend you stay away from pre-packaged flavored rice, as they often contain ingredients with gluten.